A view from above as the Enterprise is tested for vibrations. 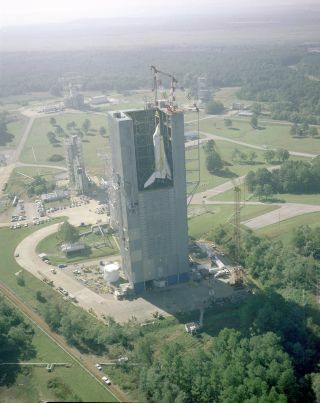 This 1978 photo from the U.S. space agency shows an aerial view of the Space Shuttle Enterprise being hoisted into Marshall's Dynamic Test Stand for the Mated Vertical Ground Vibration test (MVGVT). The test marked the first time ever that all of a space shuttle's elements — Orbiter, an External Tank (ET), and two Solid Rocket Boosters (SRB) — were mated together. The vibration test aimed to verify that the shuttle would perform its launch configuration as predicted.